AMD's much-hyped Zen CPU now has an official name—here's everything else you need to know about it. Even AMD fanboys have to admit that the company's CPUs haven’t been competitive with Intel’s chips in a decade. With AMD finally unveiling its official CPU brand, Ryzen, this afternoon, as well as the first chip’s base clock speed, there are signs Intel might actually have a fight on its hands. Here’s every single thing we know about AMD’s Ryzen CPU so far. Here are all the specs we know about AMD's upcoming Ryzen CPU next to its counterpart: the Broadwell-E Core i7-6900K. AMD shocked the PC world in August by showing its 8-core Summit Ridge CPU (featuring Zen architecture) matching the performance of an 8-core Intel chip in the open-source Blender application. The internet, of course, immediately spawned conspiracy theories that AMD “probably” used Blender because it could recompile the open-source program to run better on the Zen architecture. Wrong. PCWorld asked AMD officials if this was true. We were told that all of the demos were done using the compiled binary file from the Blender website. Last week, AMD doubled down on its performance claims by running not only the Blender test, but also additional demos of a Handbrake encode and Pixologic’s ZBrushCore benchmark. All highly multithreaded applications. And, yes, all performed using the binary downloads sans any alterations, the company insists. 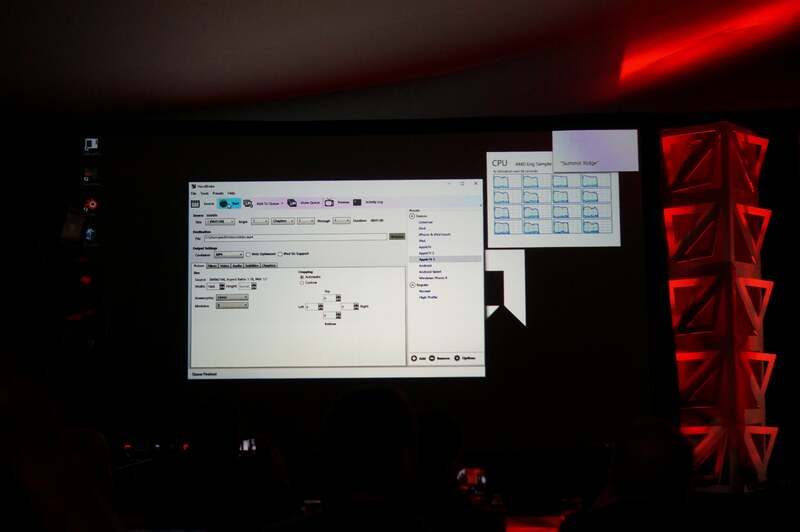 AMD demonstrated its new 8-core Ryzen CPU running a Handbrake encode and slightly outpacing an Intel 8-core Core i7-6900K CPU. 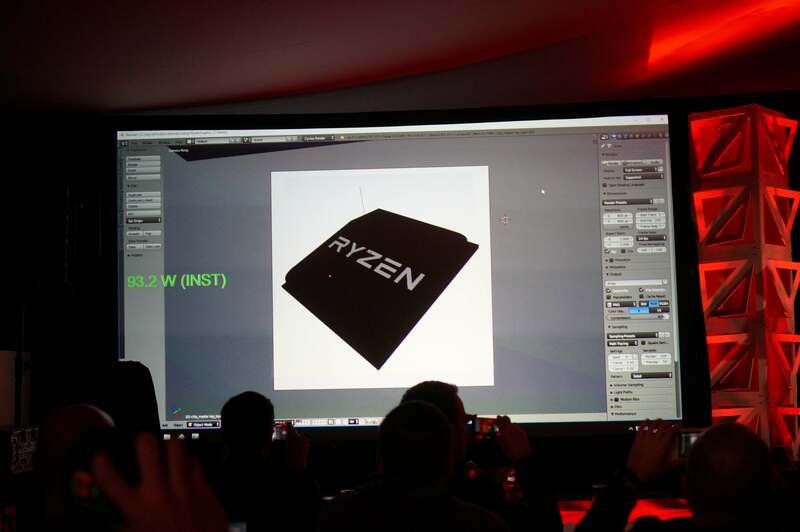 In the fall Blender demo, AMD showed that Zen could go toe-to-toe with its Intel counterpart when clock speeds were exactly the same—3GHz in that instance. That raised the question of whether AMD could actually meet Intel’s maximum speed. The answer is yes. AMD says it expects the Ryzen CPU to have a base clock of at least 3.4GHz, which is about 5 percent higher than its Intel counterpart, the 8-core Broadwell-E 3.2GHz Core i7-6900K CPU. 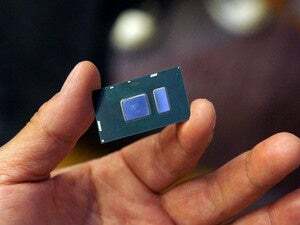 That same Intel chip, however, will boost to 3.7GHz, and even hit 4GHz under single-threaded loads. AMD hasn’t divulged Ryzen’s boost speed, so how do we know it will be as fast, or possibly even faster, than Intel’s Broadwell-E? For starters, in AMD’s demos, Ryzen at 3.4GHz (with boosting turned off) ran every bit as fast as the Core i7-6900K in Blender, Handbrake, and ZBrushCore—and that was with the Core i7-6900K’s boost mode on. If we believe AMD’s tests so far, and that Ryzen is the equal of Intel’s Broadwell-E, then it comes down to clock speeds that primarily separate these chips. Given AMD’s statement that Ryzen will be at least 3.4GHz, it seems that its CPU will have a slight edge over Intel’s. Intel’s 6th-gen, 5th-gen, 4th-gen, and 3rd-gen CPUs compared. 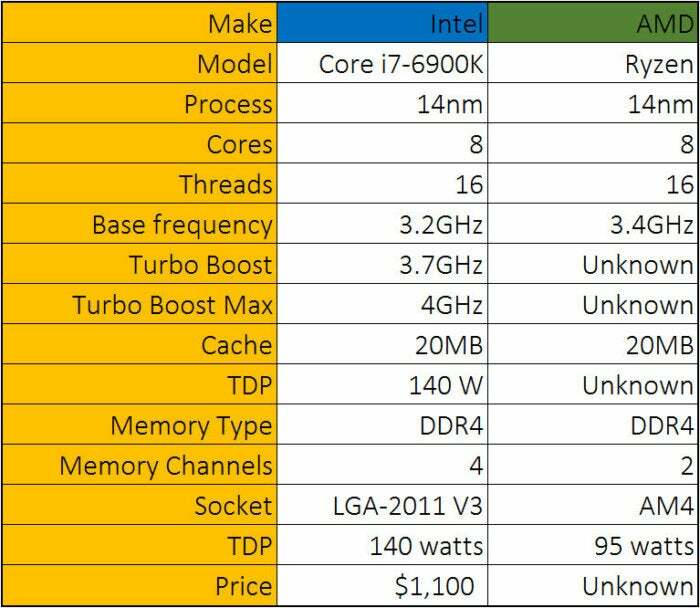 Okay, so Ryzen looks good, but it’s being matched against Intel’s 5th-gen Broadwell core. What about Intel’s 6th-gen Skylake and the soon-to-arrive 7th-gen Kaby Lake desktop chip? In pure efficiency, Skylake should have a small advantage over Ryzen. Kaby Lake, which is mostly a clock bump from what we’ve seen in laptops, builds on that lead. The problem, for Intel, is that the efficiency advantage isn’t that substantial at equal clock speeds. As I noted in my review of Skylake, when I set four generations of Intel chips to the same clock speed and disabled any boost advantage, the differences were pretty incremental (see above chart). Of course, these parts don’t all run at the same speed. Skylake has a base clock speed of 4GHz. Kaby Lake, which is mostly a refined Skylake core, should have a little more speed still. The first problem for Skylake (and probably Kaby Lake) is the ability of the 8-core chips to also run at pretty high speeds on light loads. My review of the 10-core Broadwell-E shows how that chip’s Turbo Max feature can mostly nullify any clock-speed advantage the Core i7-6700K chip has in light loads. If AMD can do the same with its boost modes, the base-clock differences between Ryzen and Skylake could be too minimal to matter. The second problem with Skylake and Kaby Lake is that both are only quad-core parts with no ability to add more cores. This isn’t the last word on performance, but the general upshot—if you accept AMD’s demonstrations at face value—is that Ryzen looks poised to put the company back into the ballpark for the first time in a long, long time. This AMD reference board for Ryzen from the unveil in the fall had four DIMM slots and that’s because Ryzen is a dual-channel-memory CPU. One thing we haven’t been sure about up until now is whether Ryzen would be a quad-channel-memory CPU like its Intel counterpart. Today, I can say for certain that it’s a dual-channel configuration. That’s because the demo we witnessed was equipped with a pair of 8GB DDR4 DIMMs, versus the Intel box with four 8GB DDR4 DIMMs. 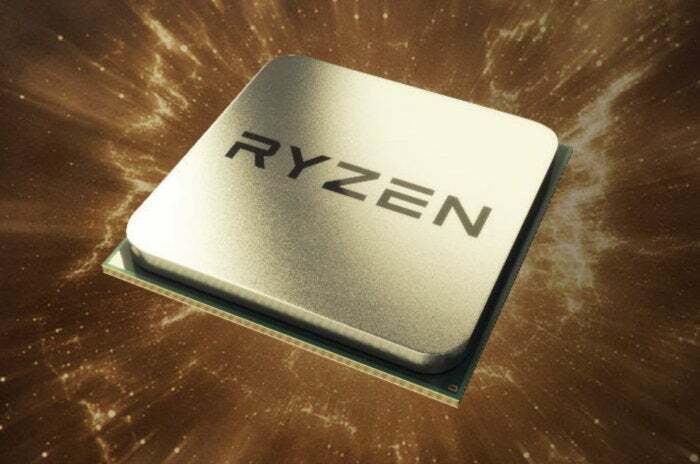 AMD’s recently announced Bristol Ridge chips are also dual-channel and use the same AM4 socket, and compatibility with Zen cores has been touted as a feature. Afraid that’ll hobble Ryzen’s performance? My own testing last year shows the impact to be mostly minimal. The one negative to a dual-channel configuration is the limited amount of RAM you can pack into a system (128GB on Intel versus 64GB with Ryzen). Intel might have a slight price advantage here as well since smaller DIMMs are usually cheaper. AMD has the possible advantage of cheaper motherboard construction. Adding more memory channels to a motherboard means running more wires or traces and also more layers. More layers means more cost. You’ll need a new AM4 motherboard and cooler for Ryzen. For many technical reasons, Ryzen just won’t work in older AMD FX motherboards. A new mounting system means you’ll need a new cooler too, or at least an adapter to make your existing cooler fit. 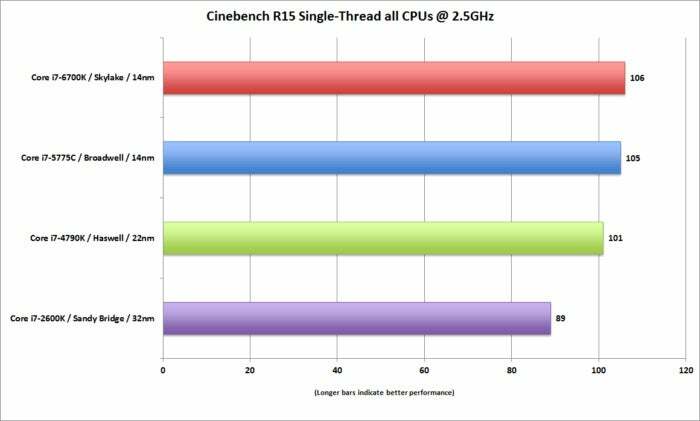 Running Blender, AMD showed its new 8-core Ryzen CPU to use a little less power than the equivalent Intel CPU, which ran at about 100W. UPDATE: AMD said during its New Horizon livestream that the 8-core Ryzen chip will have a 95W TDP, far less than the Core i7-6900K's 140W. Yup, SLI will work on Ryzen motherboards. 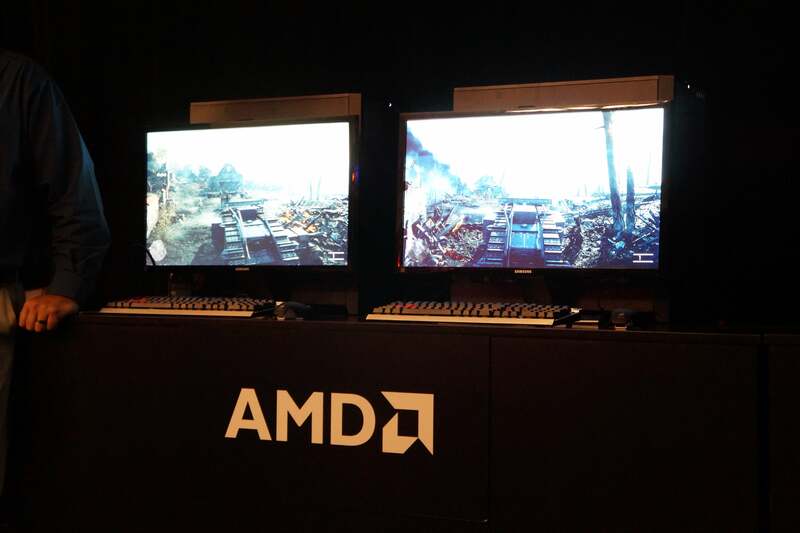 AMD showed a Ryzen and a Core i7-6900K running Battlefield 1 with SLI’d GeForce Titan X cards. AMD knows that people who buy 8-core CPUs tend to like cranking their systems to 11. In a nod to enthusiasts, the company demonstrated a Ryzen PC using a pair of Nvidia Titan X cards in SLI to run Battlefield 1 against a similarly configured Core i7-6900K PC. AMD said it wanted to prove that even with high-end configurations, Ryzen won’t be a bottleneck. 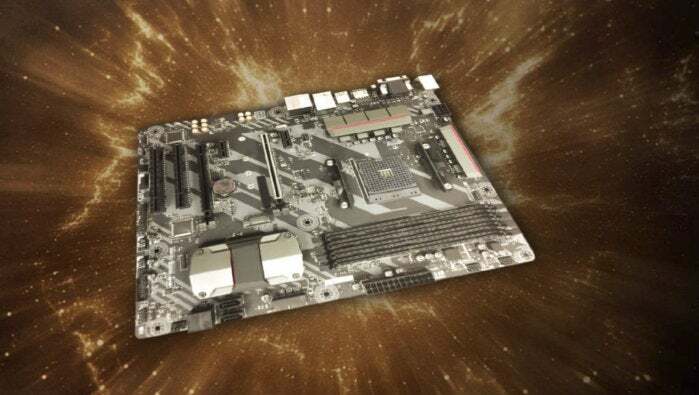 The other good news for enthusiasts is the assurance that we won’t see some walled-off AMD motherboard that forces you to run Radeon for multicard configurations. This isn’t without precedent. 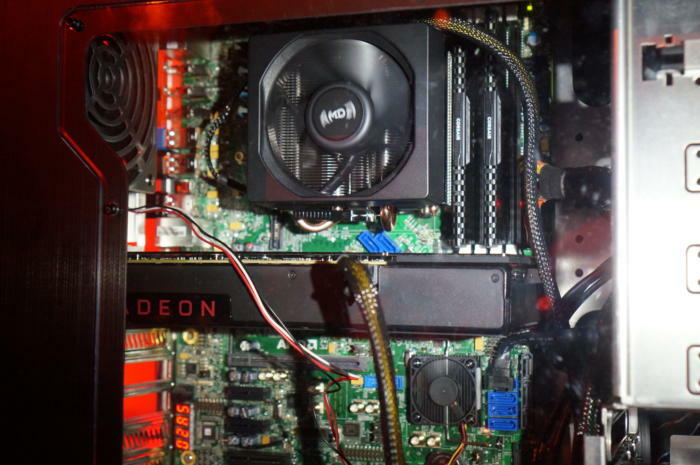 Most high-end AMD motherboards support Nvidia SLI. AMD actually considers Ryzen to be an SoC, or system on a chip, because each chip will have some south bridge functions such as USB, PCI-E, and SATA. You can read more about the reasons here, but the gist is it was made to scale from laptops to servers so, please, dude, proper nomenclature.